Our neighborhood elementary school has vegetable, flower and herb gardens that are used as a hands-on learning experience for students. Cleaning out the garden for the coming cold season, the genius behind the project kindly placed herb clippings – including rose geranium and pineapple sage – in buckets in our local (neighborhood) organic food store for the public to help themselves. What a treat. Rose geranium is not an herb that I grow, but after this experience, it will be in the future. 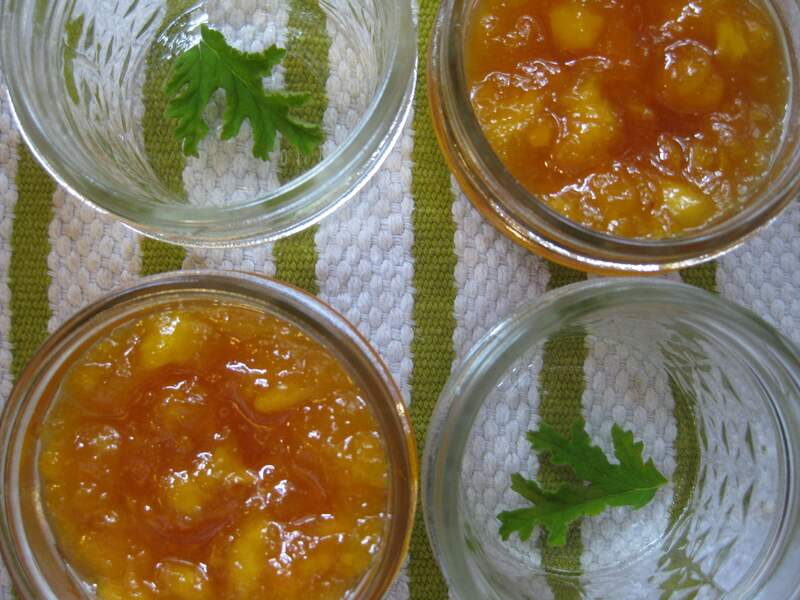 Its enticing aroma reminded me of peaches with a punch, so I added it to a so-called Peach Marmalade that I was making from a recipe in Catherine Plagemann’s Fine Preserving, as annotated by M.F.K. Fisher. She was right. This is a great jam, and was no doubt dubbed marmalade because the peaches are mashed, leaving small bits suspended, as if they were orange peels. A visually apt description at least. I changed the method and sequence to avoid browning the peaches, which I thought was important to the effect. I also omitted cooking and chopping the inner kernel of the peach pits, but only because my peaches did not yield great pits to work with. However, I’ve left that part as optional in the recipe below. Contrary to the photo, I did not leave the bits of rose geranium in the bottom of the jar, since that would have produced an air pocket, inviting mold. Rather, I cooked them with the jam and fished out most before ladling into the jars for water bath canning. You could add a leaf to each jar, but plunge it in boiling water first (wilted, it won’t create air bubbles), place it in the middle of the jam. Prepare the kettle and jars for canning. Put a saucer in the freezer (for testing the gel). Prepare the peaches. Bring a pot of water to a boil on the stove and place a second pot of water in the sink, floating ice cubes in it to chill. Plunge 2 peaches at a time into the boiling water for 30 seconds or so, then plunge them into the ice-cold water. Remove the skin with a knife (it should just slip off), halve the peaches along the natural seam, remove the pit, and place the peaches in the bowl with the lemon juice. Put the peaches and lemon juice into a large broad-based saucepan, mash the peaches and bring the mixture to a boil over medium heat. Add the sugar and the rose geranium leaves and cook the mixture rapidly for about 10 minutes, stirring constantly to avoid sticking to the bottom of the pan. Lower the heat and cook the jam slowly, stirring, for about 5 minutes or until the jam tests for gel. 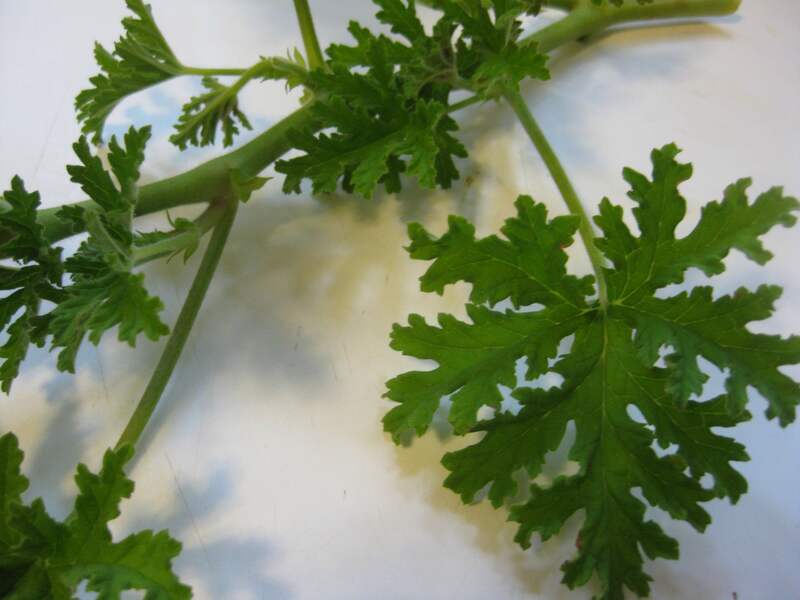 Remove the rose geranium leaves. Pour into prepared jars, insert a knife to release air bubbles, and process in a water bath canner for 10 minutes after the water returns to a boil. Turn off the heat, remove the canner lid and let sit for 5 minutes before removing the jars to a counter to sit undisturbed until cool. I do love Mrs. Plagemann’s book, but I’ve always put the leaves in the bottom of the jar and poured the hot jam right on top. It never occurred to me that this might create air pockets, but you are so right; I’ll do as you suggest in the future. Although I didn’t mention it, this was a do-over after I saw the amount of air left at the bottom of the jars after they were processed, protected by the leaves, even though I had carefully tamped out the normal bubbles. These leaves were definitely going to cause a problem, probably because of their robust structure. It’s also a safeguard to dip them briefly in boiling water, which I had done. What can I say? It’s a process! Wht a great way to use the rose geranium. Thanks for sharing it over at NDIN! !